BIG BROWN HUNTING OR HUNTED? Over the years, fishing has often been equated to hunting. I always say that fly fishing and bird hunting are two sides of the same coin. Admittedly, there are similarities between the two, especially when a fisherman quitely stalks his prey and brings it to hand. Is this what makes fishing so intriguing day-in-and-out? Maybe not. Last night, I took a break and went fishing at the Mini-Madison. I first tried a dry fly, a yellow PMX, but could not get any takers. So I decided to get down-and-dirty, with one of Kelly Galloup’s SDungeons in olive green. I quickly caught a 14 inch brownie out of a lie I call the “King Hole,” but could get no other bites. The King must have been taking a nap. I decided to try a little pocket downstream and further out in the river. This attractive spot is behind a big boulder, which blocks the heavy current so that there is some calm water below the rock. The lie is only about three feet wide and seven feet long, but it looked like a good spot for a big brown to hide and ambush prey. Getting to this honey hole was no easy task, however, as I had to manuever through strong current and slick, bowling ball sized rocks. But the effort was well worth it because on my first cast into the pocket below the big rock, I instantly saw a noticeable disturbance behind my fly. I reared back with the rod in hopes that a fish took. When the hook sank home, the huge brownie pole vaulted into the air shaking his head in the process. This nice fish gave me the funnest fight I’ve had a long time as it leapt out of water five or six times. “The strike is electrifying, yes, but the leap gives a fisherman wings.” Jerry Gibbs. Anyone who compares fishing to hunting has got it backwards; it’s the thrill of being hunted that gives fishing its charm. For a few seconds our lures swim beneath the surface we recapture the innocence — the dangerous, stimulating innocence–of the days when man walked the earth not as master but as prey. It was, it is, a dangerous thing to be a human, and we need to be reminded from time to time not only of our abstract mortality, but of a mortality that springs from ambush and clamps down. Yikes! There have been too many times to count when I have jumped in fear when a big brown trout has unexpectedly crashed my streamer, especially in the early morning or just before dark. This begs the question: Are we the hunter or the hunted? Let’s just be glad that browns don’t grow to be the size of our Snake River Sturgeon or we would all be in trouble. That thing is a monster! Way to go!! Sweet Fish! Wish I'd been there with you! Geez, Andy. The fly you used is almost as big as some of those greenback cutthroats you-know-who takes advantage of, the poor little things! 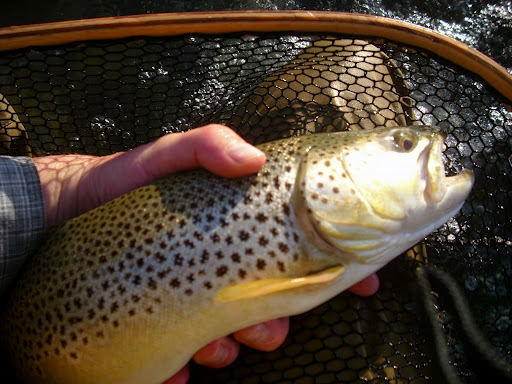 Nice blog you have here and quite a handful of brown trout. Well done! Wow, fascinating quote – I never thought of it that way!I disagree with the notion that it was dangerous to be human – I think that's something we tell ourselves because we've mostly forgotten what it was like. But the point is still well-taken.BTW, NICE FISH!